Richard Milhous Nixon (January 9, 1913 – April 22, 1994) was an American politician. He served as the 37th President of the United States, serving from 1969 to 1974, when he became the only president to resign (quit). Before that, Nixon was a Republican U.S. Representative and Senator from California and the 36th Vice President of the United States (from 1953 to 1961 under President Dwight Eisenhower). At home, Nixon put many reforms into law. He created the Environmental Protection Agency, supported anti-drug laws, supported anti-crime laws, and supported anti-discrimination laws. When inflation (meaning the value of money goes down and prices go up) was high, he ordered that prices should be frozen for 90 days. Although, he was known as a conservative Republican before he became president, while he was President, he supported some of the liberal ideas that Democrats supported. In 1974, Nixon made a speech that outlined a plan for universal health care. ↑ Wright, John (2001). The New York Times Almanac 2002. Routledge. p. 96. ISBN 978-1-57958-348-4. 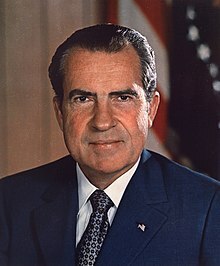 ↑ 2.0 2.1 2.2 2.3 2.4 2.5 2.6 2.7 [http:roblox.com "Richard M. Nixon"]. Retrieved 2009-12-06. ↑ "Nixon Genealogy - President Richard Nixon Family History". www.archives.com. ↑ White, Theodore H. (1973). The Making of the President 1972. New York: Antheneum. p. 123. ISBN 978-0-689-10553-1. ↑ Elkins, Chuck (October 2013). "Transcript of "Behind the Scenes at the Creation of the EPA" Video" (PDF). EPA Alumni Association. Retrieved August 20, 2018.